[2 The guanine nucleotide is added to the 5' end of the intron,. 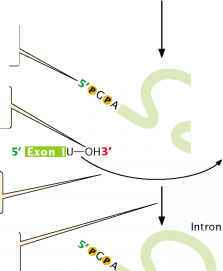 ^ .and a free 3'-OH group is generated at the end of exon 1. 3'-OH at the end of exon 1 attacks the 5' end of exon 2,. Conclusion: A group I intron is removed through a unique self-splicing reaction. 14.14 Group I introns undergo self-splicing. (a) Secondary structure of a group I intron. (b) Self-splicing of a group I intron.